We went into Berry Springs a few weeks back for a few days off. Most of that time was spent on sorting other things out and not so much holiday-mode sort of things but we did get a chance to have a look around. I am actually surprised by how nice Berry Springs is seeing as most people by-pass it. I think if people knew how beautiful it was it would be a heck of a lot busier!! In saying that, the nature park was quite packed. 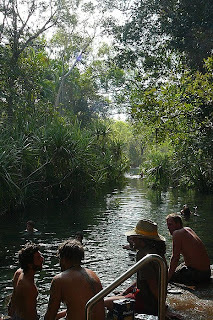 The springs and the creek are incredibly beautiful. Nicer than those at Katherine or Mataranka and I thought both of those spots were lovely so Berry Springs gets an even bigger thumbs up. 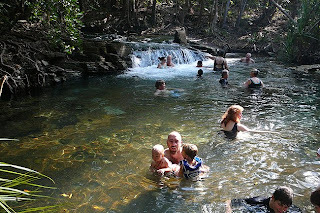 You could spend half the day at the Nature Park just enjoying the picnic grounds and floating down the creek or playing under the little waterfalls etc. We also had a quick look at the Wildlife Park. I signed up as a local (cos I have my Territory license) so I can go back for free when Nardia is here. We actually only got less than half way around the park when the boys wanted food and it was getting close to time we were back at Litchfield so we called it a day. But there is still heaps we did not get to see. But we caught the Birds of Prey demo which was great. Jordy wants to go back to see the dingos. Oh, and they were both excited to see the frill neck lizards being fed bugs for lunch. We had dinner at the local pub which was really flash! Big timber tables and an indoor waterfall pool to eat by. Rather swanky for out in the middle of nowhere! The van park we stayed at even had a waterslide!!! I think it may have been built back in the 70’s! LOL! But it was free and it was a barrel of laughs. I can’t remember when I was last on a waterslide. There was this bump in the middle that launched you off the slide and it went really fast. Tim took Jordy on it and it freaked him out despite Tim trying to go slow. 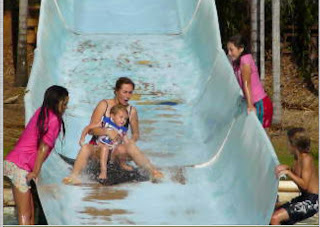 I wanted to have a go next and Jordy was terrified for me and screamed every time I took a step towards the slide. So I decided not to go and just play in the park instead. But after a bit, while Tim had him distracted, I climbed the stairs for a go. He saw me at the top and came running and yelling up the path and up the stairs to hold my hand. I think he must have gotten his courage up cos he decided to have another go with me. Did not work. He still hated it. We lucked out though and an older couple with a dog arrived and the boys played in the playground and patted the dog and Tim and I both got a chance for a few goes on the slide on our own. We did not take Darcy on it (far too fast) but I can guarantee that the little dare devil would have loved it if we had of taken him. We came the back dirt road home. 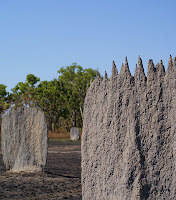 There is this massive field of magnetic termite mounds that extends for miles. The main tourist site on the other side of the park has this lovely board walk around it that keeps you well back away from the actual mounds which is all cool but you can’t really see what the mounds look like. 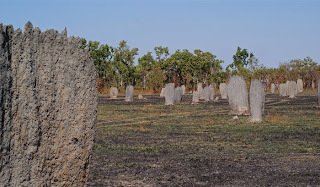 But on the back road you can just drive right up to the mounds and walk amongst them. Was interesting to see.